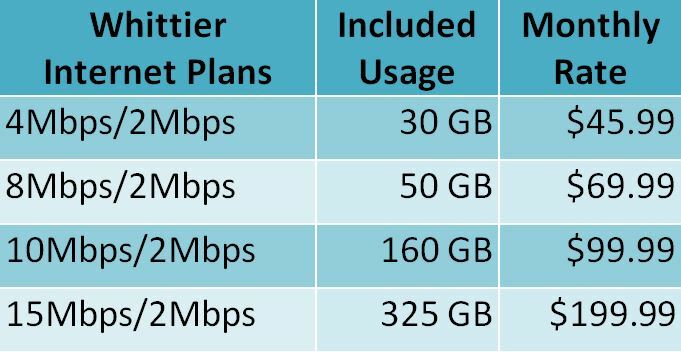 Whittier Internet | United Utilities, Inc.
All advertised plan speeds are “up to” that speed. We have a variety of plans for you to choose from, starting as low as $45.99 per month. Supervision Cable TV subscription is not required to receive Internet service. Usage/Speeds are limited when you reach your package data cap. UUI Internet offers a $34.25 discount on Lifeline Broadband service in Whittier. Lifeline is available for $165.74 per month on 15Mbps/2Mbps with 325GB. Call Customer Care for information and requirements. More information is available on our Lifeline page. Not sure which plan is right for you? Need to upgrade your package? Call Customer Care at 1-800-478-2020. We’ll be glad to help you!